Wat Soi Thong is a Bangkok temple that isn’t even on the sightseeing circuit of tourists to the city. But it’s a beautiful neighborhood temple with a very non-touristy atmosphere and it’s definitely worth a visit. 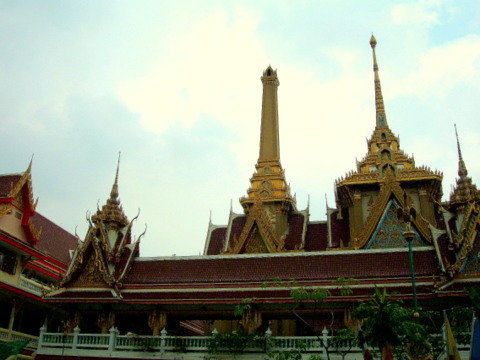 The temple is on the banks of the Chao Phraya River in Bang Sue district in northern Bangkok along the regular route of the Chao Phraya river boats. You'll pass the temple pier if you're taking a river cruise all the way to Nonthaburi province, that's north of Bangkok. 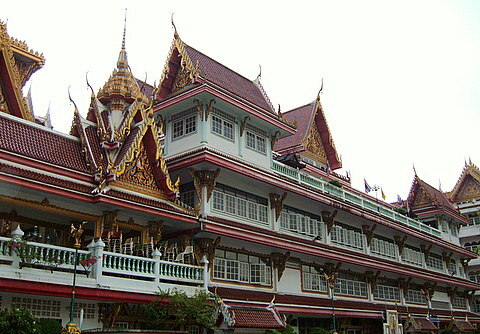 An old temple built in 1851 in the reign of King Rama IV, this temple which means "golden necklace" was built by the descendants of a Thai nobleman, Chao Phraya Sri Phipat. The temple with its glittering spires and gables houses the Buddha image Luang Phor Luea which contains the remains of five Buddhist saints. 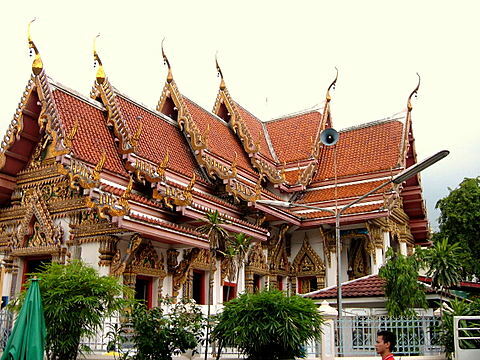 Camera buffs will love this temple with its golden spires and eaves on virtually every building. During Loy Krathong festivals, temple fairs are held in the temple grounds with vendors selling food, flowers, krathongs and toys. Temple elders also use this occasion to raise donations for the temple building fund by selling roof tiles. It's in places like these that a visitor gets to see the local flavor and spirit of Thai festivals. On Sundays, the temple is a hive of activity as families take the opportunity of a day-off to visit the temple, pray and make offerings, another aspect of daily life in the neighborhood. 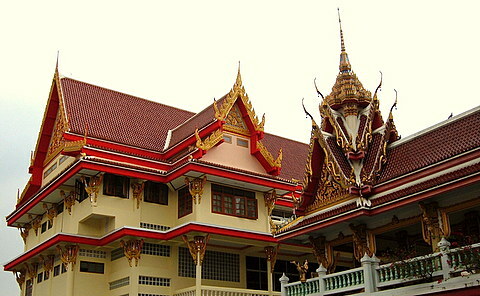 The temple is in Pracharat Sai 1 Road, Bang Sue. The easiest way to get there is to take the skytrain Silom line to S6 Saphan Taksin station. Go to the Sathorn pier that is below the Taksin Bridge and take a Chao Phraya river boat, the ordinary service, with no flags, to N23 Wat Soi Thong pier. The express boats services (with orange and yellow flags) don't stop there. Careful though, the normal boat service doesn't run on Sundays, it used to. 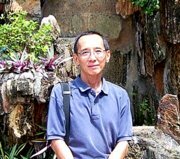 So take the express boat to N22 Bang Po pier, the pier before the temple pier.From there take a taxi or tuk tuk to the temple, just five minutes away. To return to Bangkok photographs and for other Bangkok temples.